Python’s turtle package can be used to draw various shapes on a canvas. Turtle allows the programmer to move a pen in a specified direction by specifying its heading and distance. Turtle has no built-in primitive for drawing a rectangle or square. 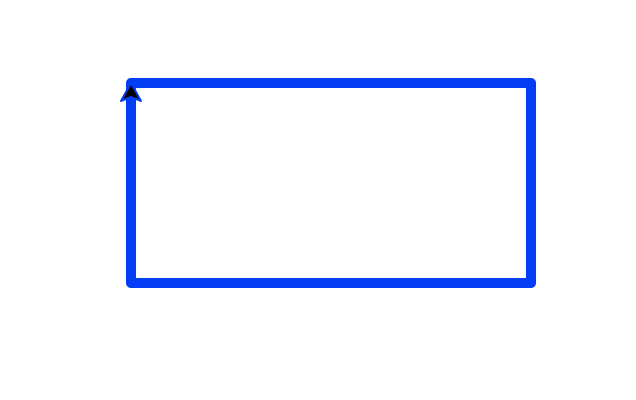 However it is easy to create a function to draw a rectangle(or square) in turtle. The following python program defines a custom function for drawing rectangles using turtle. Note that the centre of the turtle canvas is at 0,0. Hence if you draw just a dot at (0,0) it will be at the centre of the drawing canvas. The function draw_rectangle() requires the co-ordinates of the top left of the rectangle. You also need to specify width, height, thickness and color of the rectangle. The following example draws a blue rectangle which is 200 pixels in width and 100 pixels in height. 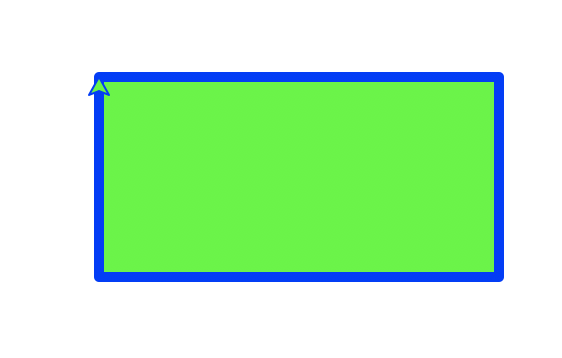 We have specified the top left of the rectangle as (-100,50) to position the rectangle at the centre of the canvas. 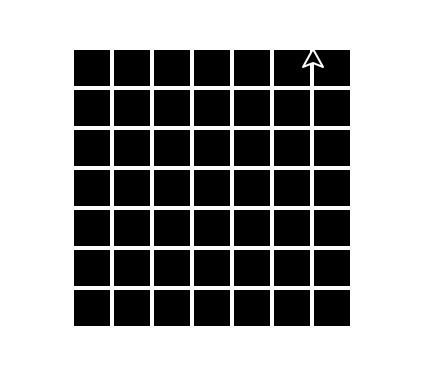 The rectangle drawn has a thickness of 5 pixels. Following python program is a different version which also allows us to specify a fill color for the rectangle. The example is identical to the previous one except that we use a different color to fill the rectangle. The following program uses looping to draw a two dimensional matrix of identical black squares. Note that we are using black as fill color and white as the stroke color for the rectangles. Python contains an interesting drawing module called Turtle. This module is available as part of the standard python distribution. Turtle consists of a number of graphics operations modelled after pen drawing. In this article I will show you how we can use the turtle commands to draw circle based shapes. The following python script creates a simple circle with default color at the center of the turtle canvas. We have defined the turtle canvas with a width of 800 pixels and a height of 600 pixels. We then draw a circle of radius 100 pixels in the middle of the canvas. Note that the bottom of the circle is placed in the middle of the canvas. The following python script draws the shape of a face using the turtle commands. We have organized the code in functions so that each section of the drawing is separate. Note that we are resetting the direction of the pen after drawing part of a circle in the draw_lip functions. The following python program creates tangent circles at the middle of the canvas. We use a loop to generate the circles and for each iteration we just change the radius of the circle. The following python program creates concentric circles at the middle of the canvas. We use a loop to generate the circles and for each iteration we change the y location and the radius of the circle. The following python program creates the olympics logo using the the turtle package. It also demonstrates the use of pen color and pen size in drawing shapes. Tkinter is one of the most popular GUI toolkits available for python. It is available as part of the standard python installation. Hence you can use this package without installing any additional modules. Tkinter is a powerful GUI library and you can use it to build full fledged user interfaces or build simple desktop games. This article contains a step by step guide on building an animation using the python tkinter package. We will be using canvas object of the tkinter package to draw our animation. Note that the following program requires python 3.6 or above. Let us now create a set of variables for our animation demo. This defines the size of our gaming canvas, speed of the ball, size of the ball and where we want our ball to start moving from. Let us now create a function to create and animate a circle in an infinite loop. We use the create_oval method to create a circle(ball) with specified radius and draw it on canvas. We move the ball until it reaches a boundary and then we reverse the direction of the ball. Note the use of move method of canvas which lets us move a drawing in the canvas to another location. Also note the use of python array unpacking to get the location of the ball. Full code of the python animation demo using tkinter is given below. This can be easily extended to a bat and ball game if you know event handling in tkinter. Save the following code in “tkinter-draw-demo.py” file and then run the command “python3 tkinter-draw-demo.py” to see the animation. When working with textual data in mongodb, you may want to fetch documents with partial match on a field. You can use the $regex operator in mongodb for running like queries. By default, the like query using $regex is case sensitive. The following mongodb query fetches all documents where countryName contains “rab” anywhere. This query is the SQL equivalent of “%rab%”. The above query returns documents for “United Arab Emirates” and “Saudi Arabia”. But if you replace “rab” with “RAB”, not document is returned. For doing a case-insensitive search, you need to use the $options for $regex as given below. The above query returns documents for “United Arab Emirates” and “Saudi Arabia” by doing a case-insensitive search. Run the following query if you want to retrieve all the countries where the name starts with “In” by doing a case-insensitive search. Run the following query to retrieve all the countries where the name ends with “tes” by doing a case-insensitive search.